Last semester I took a class called NIME: New Interfaces for Musical Experiments. Students are propmted to innovate how we generate sound and how we perceive it as a musical performance. My final piece was a performance in which I had small “instruments” that manipulated the sound on the background, as a way of breaking the expectations we have over the “beautifying” routine females are granted to be doing so. So, there are a few things that are happening and function as instruments. Most of them are working through MaxMSP – except the analog synth necklace. a webcam is using computer vision to detect how much of my lipstick I have on my lips and controlling the volume level. I feel this was the trickiest of the instruments, because the color percentage recognition with computer vision rely so much on proximity and lighting. 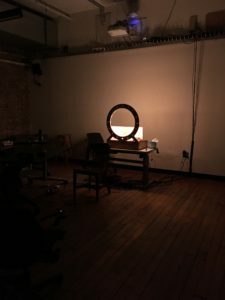 I was able to control the lighting by making my own light frame – and also it worked as prop to make the audience feel like they were looking through the mirror, as if it was almost a peep show from a female getting ready. 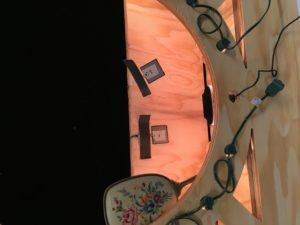 It also worked as a way of hiding the webcam, all my electronic components and computer from the audience. 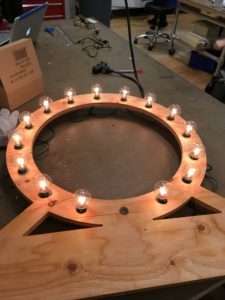 I fabricated the frame by cutting the wood on the CNC and the light is actually a christmas light socket for medium bulbs. After I had the light working properly, I started calibrating on the computer to make the color capture more accurate. It is still very flickery and I have to be very cautious about my position. FSR sensors that sampled the song as I put my earrings. Being a wearables enthusiast, I was trying to push how i could make the earrings part of the performance. 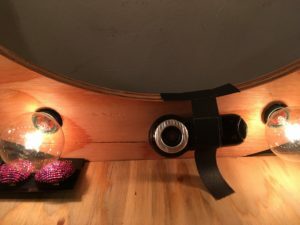 After a few tests and talks with professors & colleagues that work with live performance, I decided to create an illusion trick here: I had 02 FSR sensors over the lid of the wooden box/light frame connected to an arduino > connected to a MaxMSP patch. As I put my earrings, I brought the attention of the audience to the earring and my ear – while i was touch one of the FSR sensors with my elbow. So when I put the first earring it starts sampling and when I put the second earring it ends the sampling and start looping it. For the performance, I decided to do a necklace and work with metal chains within necklaces to chance the pitch. 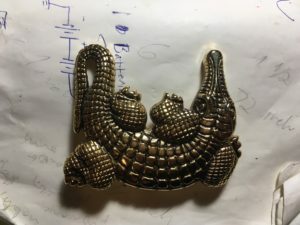 I also to use a different type of chip, which made the circuit smaller to fit inside the golden crocodile. 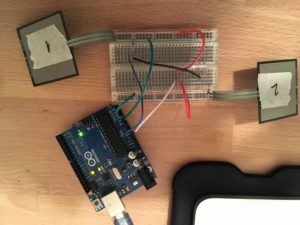 Once I had it working on a breadboard, I went and did a PCB for the circuit and for the batteries. IT doesn’t need that much voltage nor current, so I was able to use three coin cell 3V baterries. 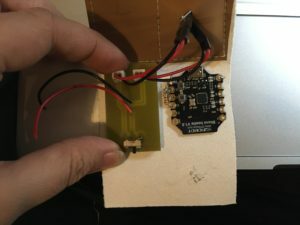 The only issue was that I didn’t know how to make it wireless in the time I had, so it was directly connected to the mixer (but it worked fine!). 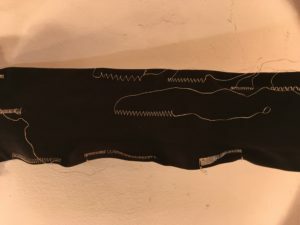 A stocking that controlled the speed of the sample. 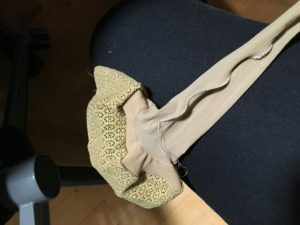 I think this was an experiment that worked really well and it was a bit clumsy the way I sewed the conductive thread. 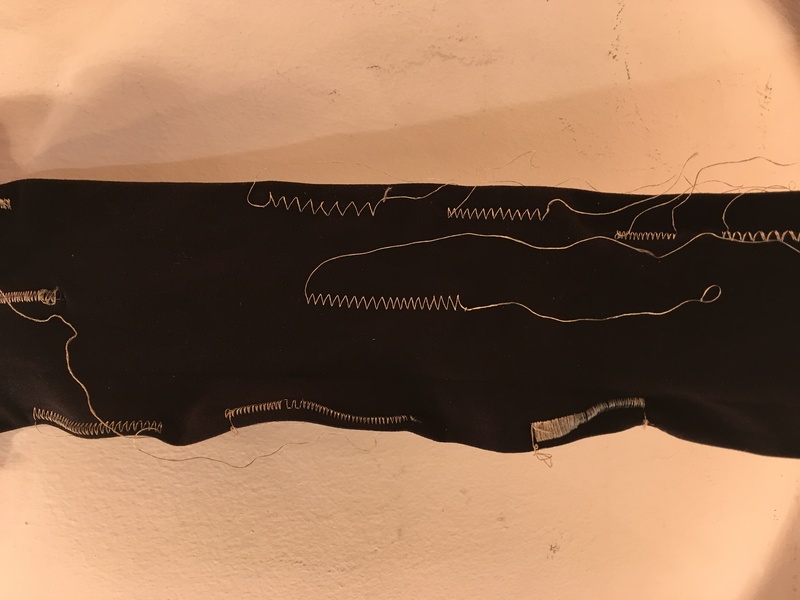 Sewing stockings in the sewing machine is really tricky, but after a lot of tests I was able to make my own system and machine settings to do so. The zigzag needs to be loose (thread can’t be too tensioned), so that it has movement to stretch without breaking. Since conductive threads are unstable, after testing a variety of conductive threads I ended up choosing to work with Agsis Conductive Silver Nylon Thread. Its conductivity is really good and because it has ~ nylon ~ in the composition, it’s hard to break. Once I had the stockings working, I went on another venture: try to make it wireless. After talking with Rubin, one of the residents from ITP, I decided to give a try to the Bluno Nano family. They are arduino MCs that have build-in bluetooth, really easy to pair between themselves and uploading code is just like any arduino board. I had then two MCs for this experiment, one that was the central / connected to the computer and sending the variations of the stockings to MaxMSP; and the other, peripheral, on the stockings, to sense and transmit the stockings variations. Ideally I would have a microcontroller in each stocking but bluetooth devices can only pair one device a time. 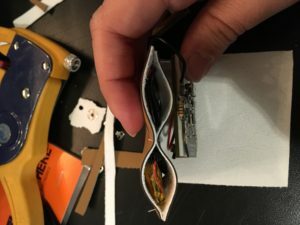 The solution I came up for this issue was to make a pocket with the microcontroller that had a metal snap (conductive!) that could be attached to the stocking – and be changed in the middle of the performance. I also did some battery holder PCB to attach to the microcontroller and look super seamless. 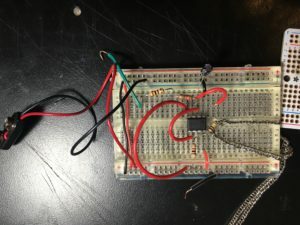 For some reason that I didn’t figure out in time, the way I was arranging the batteries was not giving enough voltage for the microcontroller (it was picking, would work for 5 seconds and then stopped working). 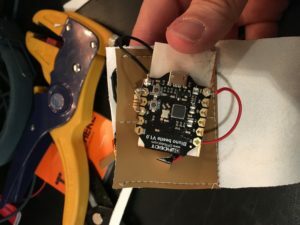 So for the performance, I just connected the microcontroller pocket to a power socket, like a phone charger. To make the pocket, I used a fake leather vinyl fabric I have worked with before, cut it on the sillouette machine / sewed it on the singer.